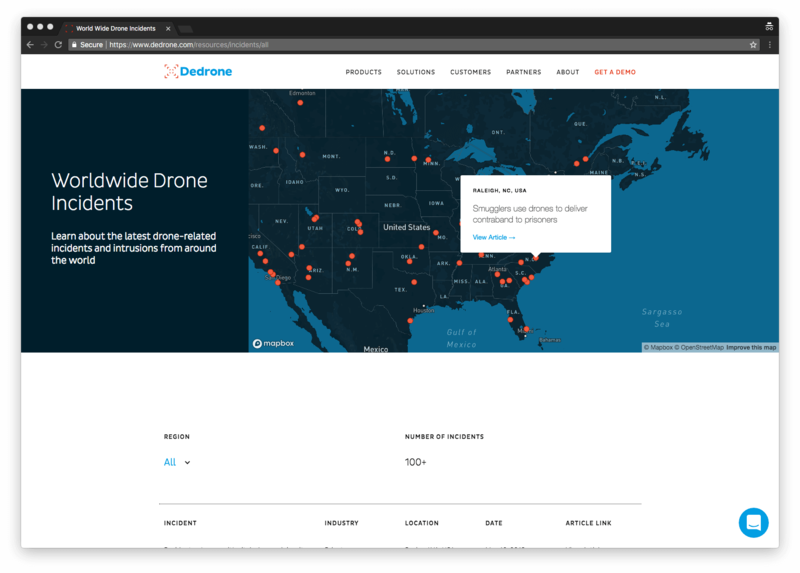 The Dedrone team is excited to introduce our newest resource, the Drone Incident Center. This interactive resource is designed to make it simple to see where in the world drone incidents are being reported publicly. This is beyond what a government agency may be collecting, industry reports sharing or stakeholders speculating. These are real incidents in our backyards, businesses, airports and other areas, witnessed by concerned citizens and reported on by the media. To use this tool, simply scroll through our list of incidents we’ve seen in the news, or narrow your search down to your region. We categorize incidents based on the type of interruption the drone causes. A drone flight does not reveal where or why the pilot was in the area, and if the interruption was intentional or not. Trespassing: A fence on the ground, whether protecting a home or power plant, is not enough to stop trespassers in the sky. Activity Interruption: In controlled airspace, such as at an airport or during disaster recovery efforts, an unauthorized drone will force first responders and other pilots to interrupt their actions and wait for the pilot to be apprehended, or the drone to fly away. Crash: Whether the pilot is untrained, a gust of wind takes a drone off course, or a drone is manipulated, the hardware can become a dangerous projectile and harm property or people. Note, we do not include any activity related to military or defense activity, unless it involves a civilian interrupting government activity. For further reading, check out our Resource Center.